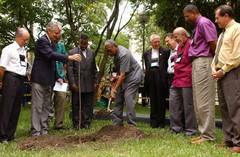 A tree planted on the Catholic Pontifical University campus in Porto Alegre will serve as a lasting reminder of the Assembly. The campus of the Catholic Pontifical University in Porto Alegre - the Assembly venue - will have a lasting reminder of the event. 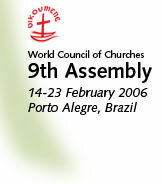 WCC general secretary Rev. Dr Samuel Kobia and three past general secretaries - Rev. Dr Konrad Raiser, Rev. Dr Emilio Castro and Rev. Dr Philip Potter - planted an Ipê tree, whose yellow flowers appear during Lent. The ceremony included representatives of Brazilian and Latin American churches. Rev Joachim Clotet, rector of the university, said, "I will pray this as I pass by on my way to work: 'God, in your grace, transform the world.' "
Castro referred to the "ecumenical tree", which he hoped would be a symbol of the WCC's commitment to be responsible for caring for creation. Appropriately, the morning and evening worship of the last day of the Assembly has seeds as its symbol.